Galloway, NJ (May 21, 2013) — The unofficial start to the summer season begins in South Jersey with “A Shore Tradition” The ShopRite LPGA Classic Presented by Acer. The tournament begins Monday, May 27 on the Bay Course at Stockton Seaview Hotel and Golf Club in Galloway, NJ and concludes with the crowning of a champion on Sunday, June 2. The final field of 144 has been set and includes the Rolex Rankings top 10 players in the world along with 95 out of the top 100 players on the LPGA’s money list. Practice and Pro-Am rounds held Monday, May 27 through Thursday, May 30 are free to all patrons. ShopRite will once again offer Price Plus Card holders two free daily grounds tickets by showing a valid Price Plus Card at the Tournament's Main Admissions Gate. Children ages 17 and younger will be admitted free into the Tournament all week courtesy of Horizon Blue Cross Blue Shield of New Jersey. Additionally, on Saturday, June 1 each Horizon Blue Cross Blue Shield of New Jersey member will receive free admission for two, by showing their healthcare card at the Main Admissions Gate. 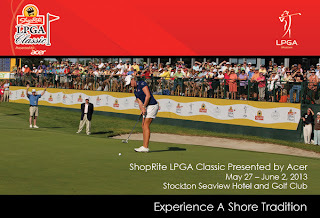 Enterprise, the official rental car of the Tournament, is offering anyone who rents an Enterprise car during Tournament week a voucher for two free one-day grounds tickets to the ShopRite LPGA Classic Presented by Acer. Service personnel including fire, police and military will be admitted free all three days of championship play by showing proper credentials at the Main Admissions Gate. GEICO will be hosting a putting challenge at their booth Friday through Sunday; stop by and enter to win a foursome of free golf. Kia is back as the Official Automobile of the event and will have displays throughout the golf course that fans can interact with and win prizes. There will also be an opportunity to win a Kia for a hole-in-one for anyone playing in the Pro-Am. The Philadelphia Section PGA will be providing complimentary golf lessons in spectator village during Tournament play. Michelob ULTRA will be the official beer of the event and will be featured at the 19th hole and on-course Beer Garden. Snapple has returned as the official iced tea of the event and will be featured throughout the Tournament grounds. Dunkin' Donuts will provide samplings of product during the Tournament in the spectator village. It will be hosting a contest through their social media platforms to give away an Inside the Ropes VIP Experience. For details, visit facebook.com/DunkinPhilly or twitter.com/DunkinPhilly. Rothman Institute Orthopaedics will be providing injury prevention and stretching exercises to all patrons in the spectator village. Sparkling ICE will provide free samplings of product during the Tournament in spectator village and also at the 9th Hole Sparkling ICE Hydration Station. All three rounds of championship play will be televised live on Golf Channel. For the latest tournament news and information, visit ShopRiteLPGAClassic.com.